This section provides information about prices, what to expect on the day, how to book, and other important information. Please read through the information carefully as it will help you choose which package and venue best meets your requirements. We always welcome a phone call to answer any questions that you have, to discuss options, or if you have something more unusual in mind! 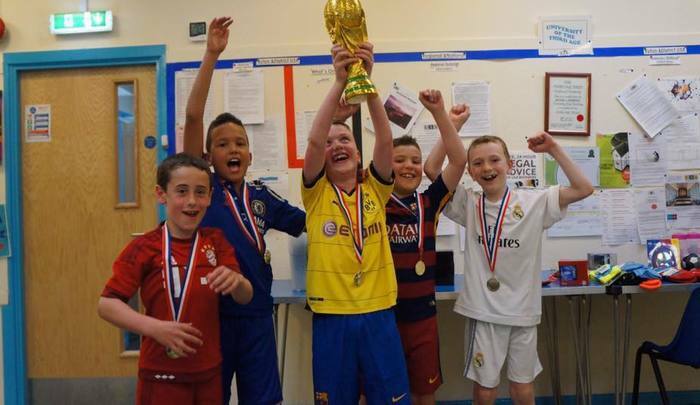 Feedback from our previous futsal and football parties has been amazing – you can see some reviews on this page or check out our testimonials page or Facebook page for more. We hope that you will give us the opportunity to lead your son or daughter’s party – our aim is for them to have an amazing birthday to remember! The table below shows prices for parties at the venues we typically use. If you have another venue in mind, prices will be altered based on the hire charge. If you are sharing a party with a friend, (i.e. there are 2 birthday boys/girls) there is an additional charge of £15. The prices here show the cost of the party at Barmoor Hub*, Thorp Academy and Blaydon Youth Club. *If you want children to eat in the large room at Barmoor there is an extra £10 charge. We offer a 10% discount for children who: attend our Monday night futsal sessions, are regular attendees at our holiday coaching courses, or who have been to our parties and have a discount voucher. We ensure that our parties cater for all abilities. This means that we play a number of games that all children will enjoy regardless of their skill level. Typical party schedules are shown below, however we can adjust the activities and timings to suit your requirements. Please let us know when booking the party, any changes from the recommended programmes you would like. 45-80 min World Cup football tournament - players are put into international teams and play against each other. If time permits there will be a final between the teams who have the best win/loss record. 20-45 min Players are put into teams for football challenges. Depending on the venue this can include: Cross-bar challenge, keepy-ups, power shot (measured with a speed radar), shooting accuracy (using an inflatable goal with targets). 45-80 min World Cup Football Tournament. Players are put into international teams and play against each other. If time permits there will be a ‘Final’ between the teams who have the best win/loss record.